Website orders restricted to U.S. customers. Click here to find a distributor in your country. 30 Day Satisfaction Guarantee! 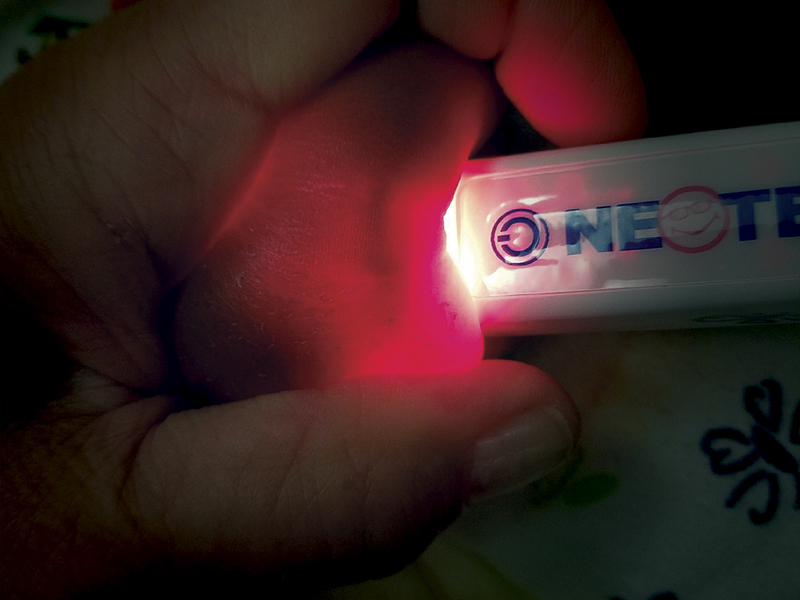 Neotech is delighted to offer this affordable transillumination device. 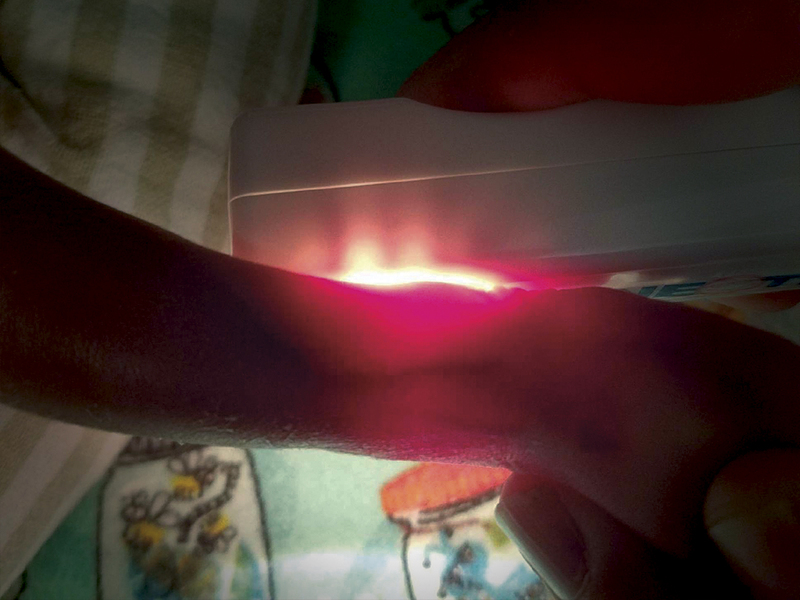 With multiple settings for user preference, it’s perfect for clinicians looking to purchase their own personal transilluminator. There are eight colors to choose from to fit your personality. It also has a lanyard loop to help ensure that your NeoGlo doesn’t walk off with someone else. 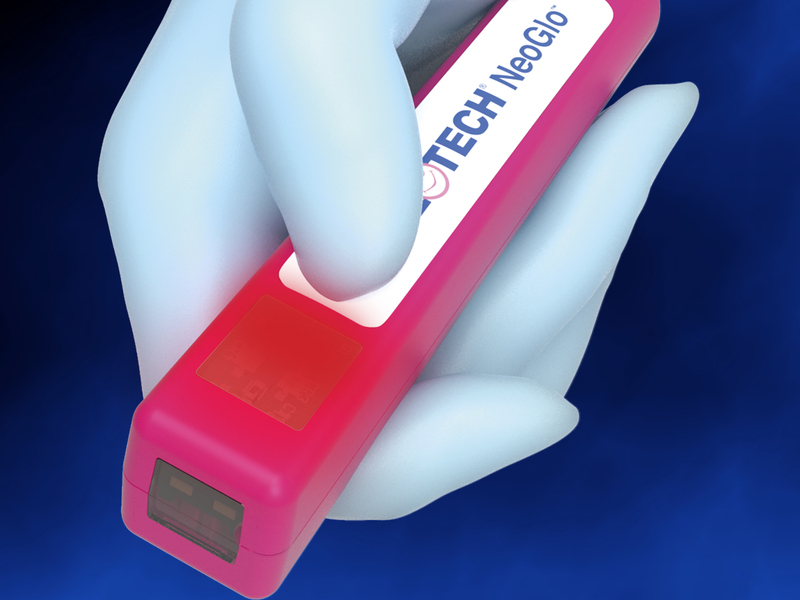 The NeoGlo Sleeve helps to guard against fluids and keep the NeoGlo clean. Step 1 Remove battery cover, insert AA alkaline battery (included) and replace cover. Note: Light settings will cycle through once and return to off setting. Caution: Do not stare directly into lights. – Press power button once for forward facing white lights. – Press again for upward facing white lights. – Press again for upward facing red lights. – Press again for upward facing white and red lights. – Press again to turn off. – Repeat cycle as needed. 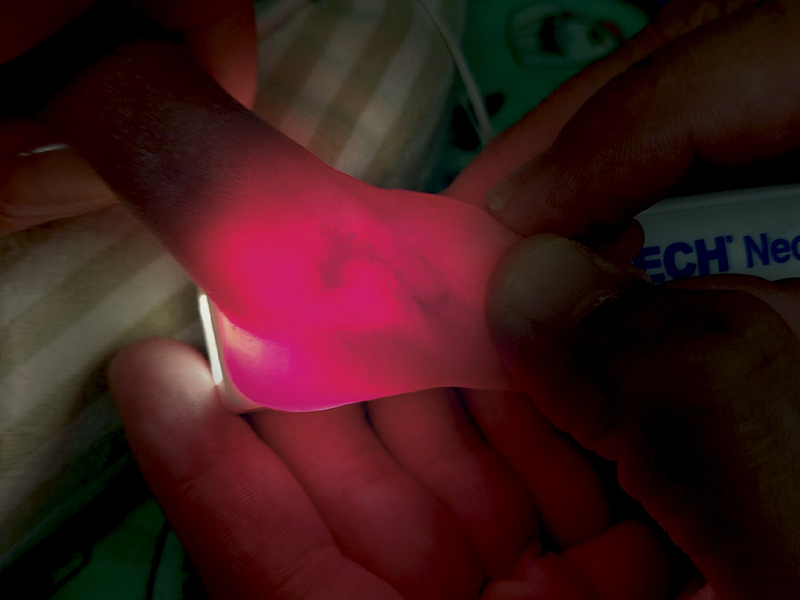 Step 3 With preferred light setting on, hold NeoGlo to patient’s skin for illumination. Note: Dim room lights for most effective illumination. 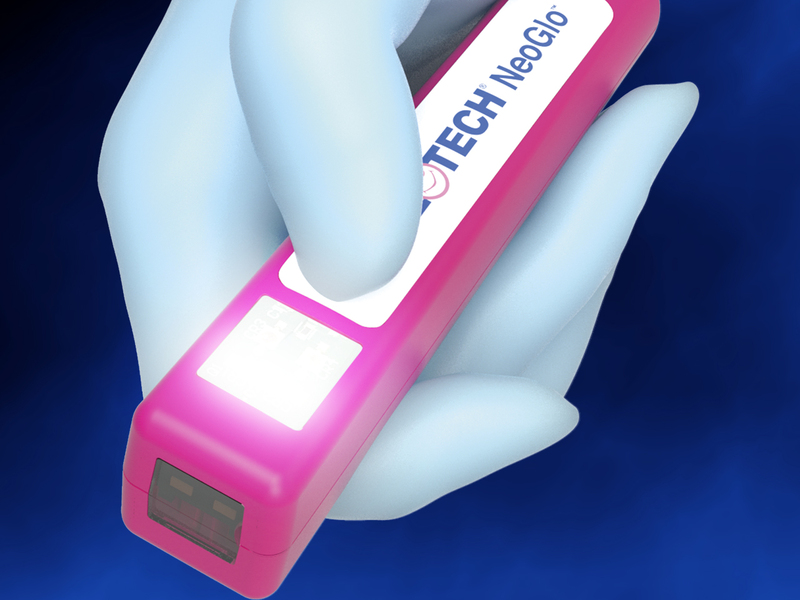 Step 4 Clean NeoGlo with alcohol wipe or CaviWipe™ after each use. Step 1 Clean NeoGlo Transilluminator with alcohol wipe or CaviWipe™. Step 2 Slide NeoGlo into NeoGlo Sleeve, lens side first. Step 3 Remove adhesive liner, fold self-sealing flap over back of NeoGlo, and seal. Note: For most effective illumination, sleeve should be as taut as possible. Step 4 Discard NeoGlo Sleeve after each use. Pease note: if NeoGlo is stuck on a particular setting and will not turn off, this may be an indication of a low battery. Replace with a new AA alkaline battery. Do not use a rechargeable battery. If problem persists, please contact Neotech at 1-800-966-0500. 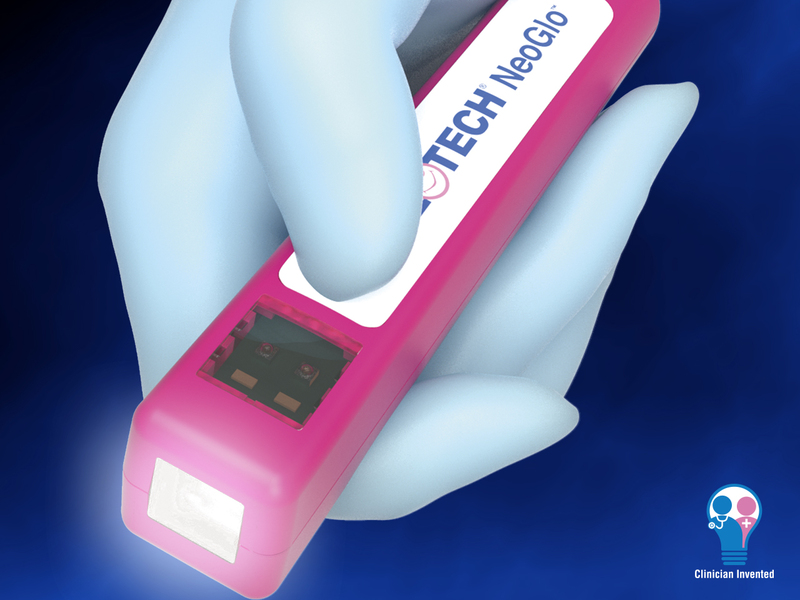 The NeoGlo Transilluminator is a hand-held, battery-powered device that is a light source intended to transmit light through tissues to aid examination of patients. 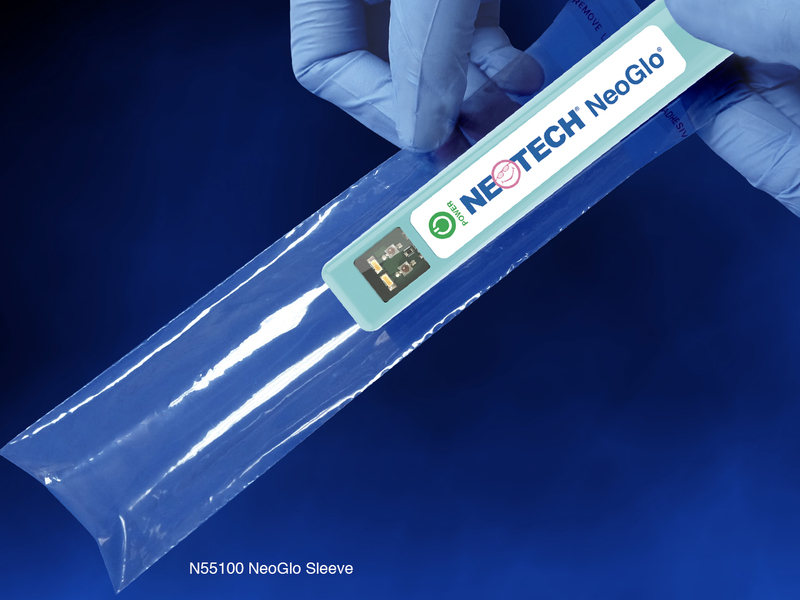 The NeoGlo Sleeve is intended for use as a temporary protective cover to help keep the NeoGlo Transilluminator clean. Do not shine light directly into eyes. 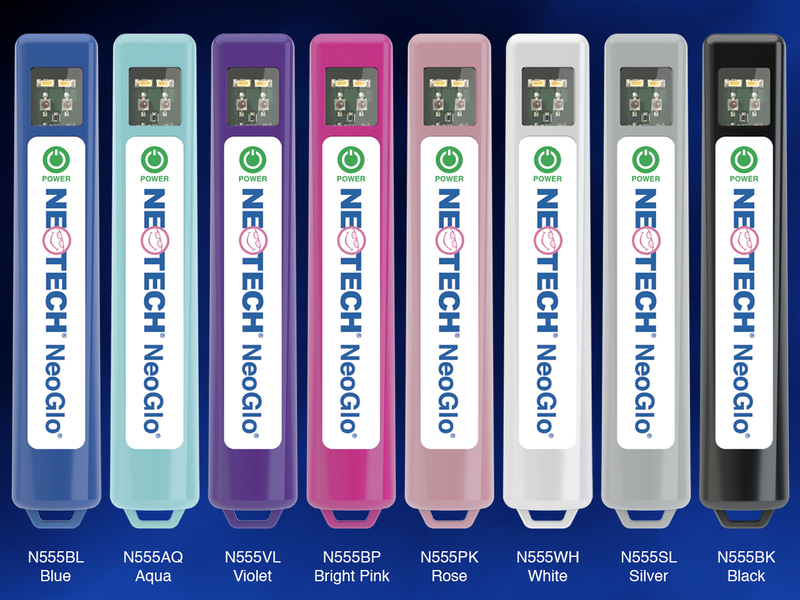 Do not submerge NeoGlo in liquid. Do not autoclave NeoGlo. Exposure to steam or excessive humidity may cause electrical failure. Use AA alkaline batteries only. Do not insert rechargeable batteries. Inserting battery incorrectly may damage the unit and void the warranty. 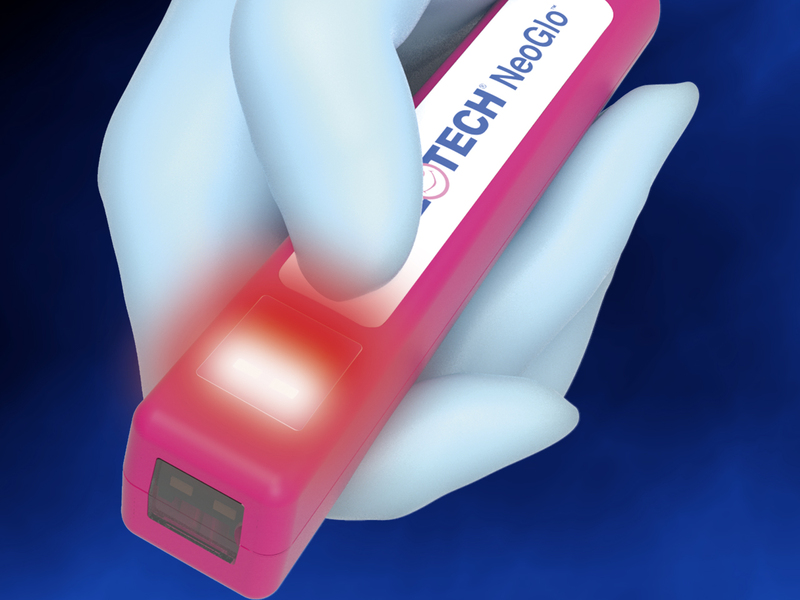 Dispose of NeoGlo in accordance with local electronic regulations. NeoGlo Sleeve not intended to protect NeoGlo from water or other damage. NeoGlo Sleeve single use only.